The Unsolicited Advice planner looked too fun to pass up. This guy's stuff looks so funny and real I must have it. I also ordered his book 1 Page at a Time (from Amazon) because again, how could I resist? Then after I put my payment through, Kickstarter recommended for me the It's Different Every Day calendar, which also looked like lots of fun. I thought my kids would like the daily activities, facts and quotes. So I pledged for that one too. They are not yet at their funding goal, and I really hope they make it because I really want this calendar! Then I was on a planners kick so I went to check out one that several people have recommended to me: the Passion Planner. 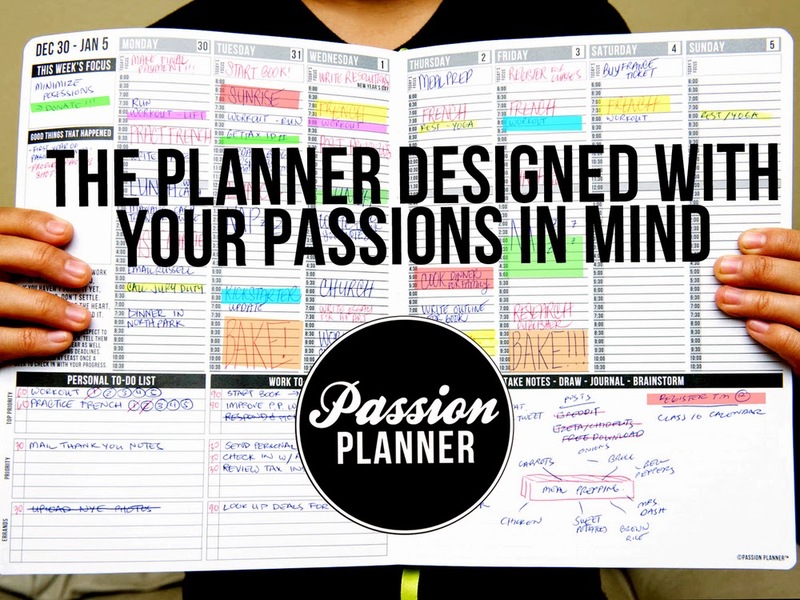 Image totally lifted from PassionPlanner.com but since I'm using it to promote their planner surely they won't mind. This one isn't on Kickstarter anymore, but it was last year. Anyway, it looks similar to a gigantic version of my Plannerisms planner (which is still not printed, don't ask). After reading the testimonials and story I finally caved and ordered one, despite the fact that the 2015 version has Sunday-start weeks which I don't really like but am willing to overlook if I love the rest of the planner. I downloaded the free weekly pages so I can try it out in the meantime, but I'm looking forward to seeing the rest of the content of the book. ***Updated: I only just now discovered that there is a Passion Planner half size (5.5 by 8.5 inches) on Kickstarter. It has all the same features of the full size one in a more portable book. Click here for a flip-through to check it out. I have to admit there's some really exciting new planners on Kickstarter these days. I really like seeing new and different planners coming out. Recently I posted about the Week Dominator planner's Kickstarter campaign. It has been fully funded so I'm really excited to get mine soon! Since none of these planners are shipping yet, it will be awhile before I receive them. But once I do you can count on reviews! I had a look at a couple of these after seeing them mentioned here - love the Unsolicited Advice diary. The PassionPlanner is a bigger size than I usually like for a planner but I really like the looks of the layout. I am looking forward to the review! I have two here already and a Time Traveler weekly on the way. I'm hoping it is exactly what I want! I'm struggling trying to figure out what I want for 2015. I REALLY like the look of the passion planner, but I like having my weekend days together. I'd totally buy one if they had a Monday start. I'm tossing around the idea of getting a PlumPaper Designs Planner from Etsy. but they are taking 4ish weeks to ship as well!! I don't know. Hopefully something will click before Jan 1! I never thought of looking at Kickstarter for planner related goods! Thanks for sharing. ACK! Why why why does it have to be a Sunday start?! I really like having my weekend days together. Totally thinking of getting one anyway though. I printed out and put in a folder the 8.5x11 version today, and couldn't bear to fill it out because it's MASSIVE. I could see how this type of planner would be allow me to have work, home and "notes" all in one place though, and I love the 30 min time slots! So. . .to buy or not?